I had a fitful night of sleep last night; my brain was consumed with images of Los Angeles, and wondering how on earth I would be able to pull off my urban gothic vision for $5k? Am I delusional? Do I have a fever? And then, I realized… it’s all in the details. Episode One is two exteriors; however, they are in the day. There is some VFX involved, but I believe that under-cranking can readily take care of that. Episode Three is three-four interiors and one exterior. The exterior is in the day. It was Episode Two that had me stymied. It’s the most ambitious of the three – and most of it takes place at night. There lies the rub. Night shoots are not cheap, even with digital. I also had this vision of these sweeping shots of L.A. at night, from above and below, a Gotham like look at Hollywood. Most of it occurring in alleys and streets; definitely not a running and gunning type of setup. I was worried, truly worried. I am striving for high quality at low-cost. Like everyone else, I want for my work to excel. Then, I realized that I could move most of Episode Two indoors. Two – three brief night exteriors. 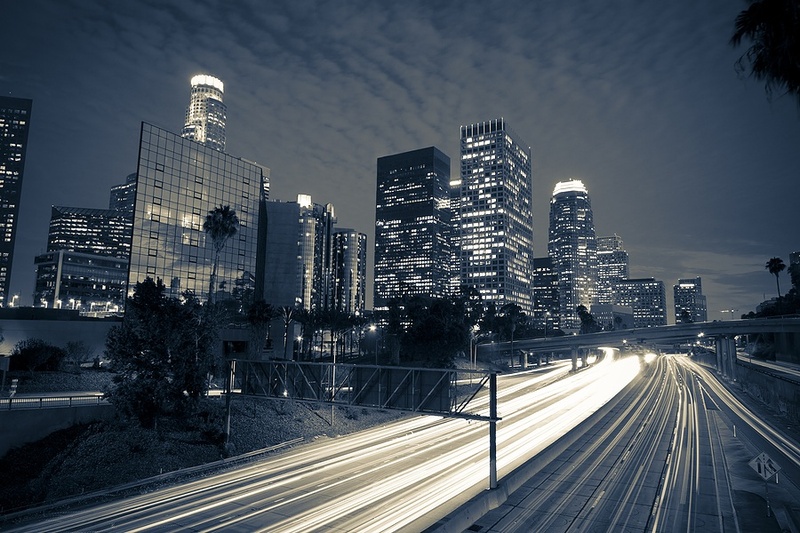 Perhaps fill in with great stock footage of L.A. at night… and keep the majority of the story inside. By doing so, I can lower the cost of the episode. I then realized that this choice also opened up a door within the story that was a little stuck. It solved a problem. It’s making the story better. More layered. More conflicted… and more tragic. I’ve added the option for digital downloads of “They Live Among Us” for my Kickstarter supporters; green is always better. I’ve also had a request for a one-page of the series from one of my contributors. How silly of me to not have created that. So, I’ll tweak Episode 2 to move it inside, and get to work on my one-sheet. In the meantime, I’m meeting with some D.P.’s and looking for a designer for the logo/title. I know what I want… I’m just not as crafty with Photoshop as I am with Final Draft. To all of you following this adventure, thank you for your support. If you wish, please contribute to my Kickstarter Campaign. Twenty-eight days to secure funding! I’m certain that they will go by in a flash. This entry was posted in Uncategorized and tagged bullshed productions, filmmakers, Final Draft, Hollywood, Horror, Kickstarter, Los Angeles, microbudget, Photoshop, pre-production, screenwriting, script, supernatural. Bookmark the permalink. I look so forward to the progress made on this great film! Thanks so much Anne! Thank you! It is quite an adventure… each day is jam-packed…. such a good thing! This sounds very exciting. Thank you for sharing your journey with us. I find it very informative since I’m also trying to pursue a screenwriting career. If you are interested, I am a graphic designer so if you need someone to create the logo/title for you, I can definitely help you. My portfolio site is http://www.iantopple.com.